Throwing a fabulous gathering is as easy as 1, 2, 3 when you have a handy checklist to guide you. 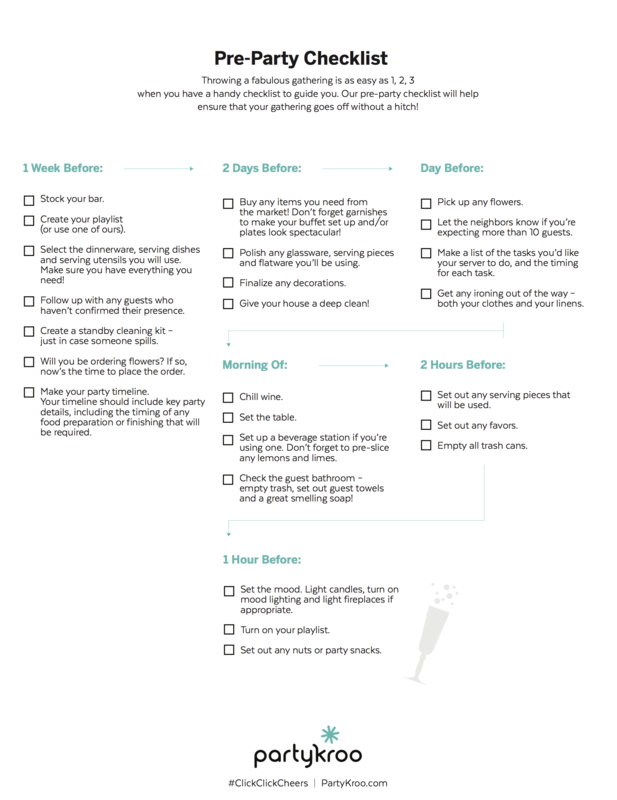 Our pre-party checklist will help ensure that your gathering goes off without a hitch! • Create your playlist (or use one of ours). • Select the dinnerware, serving dishes and serving utensils you will use. Make sure you have everything you need! • Follow up with any guests who haven’t confirmed their presence. • Create a standby cleaning kit – just in case someone spills. • Will you be ordering flowers? If so, now’s the time to place the order. • Make your party timeline. Your timeline should include key party details, including the timing of any food preparation or finishing that will be required. the market! Don’t forget garnishes to make your buffet set up and/or plates look spectacular! • Polish any glassware, serving pieces and flatware you’ll be using. • Pick up any flowers. • Let the neighbors know if you’re expecting more than 10 guests. • Make a list of the tasks you’d like your server to do, and the timing for each task. • Get any ironing out of the way – both your clothes and your linens. • Create an easy checklist for your KrooMember to follow and use. • Set up a beverage station if you’re using one. Don’t forget to pre-slice any lemons and limes. • Check the guest bathroom – empty trash, set out guest towels and a great smelling soap! • Set out any serving pieces that will be used. • Set out any favors. Empty all trash cans. • Set the mood. Light candles, turn on mood lighting and light fireplaces if appropriate. • Turn on your playlist. • Prep your KrooMember and let them know where the essentials are located and what you’d like them to be responsible for before, during and after your party.